Is there anything quite so satisfying as a gooey, warm cinnamon roll? How about a gooey, warm vegan cinnamon roll that’s oil-based and topped with almond vegan buttercream frosting? This recipe was originally shared on February 25, 2018. It was updated with new photographs and writing on November 25th, 2018. Ooey gooey cinnamon rolls are an important part of the Christmas season at my house. We make homemade cinnamon rolls every. single. year. I can’t remember a year without them! There’s just something so special about that sweet, enriched dough combined with a slathering of creamy almond flavored frosting. Cinnamon rolls are so mouthwatering good! 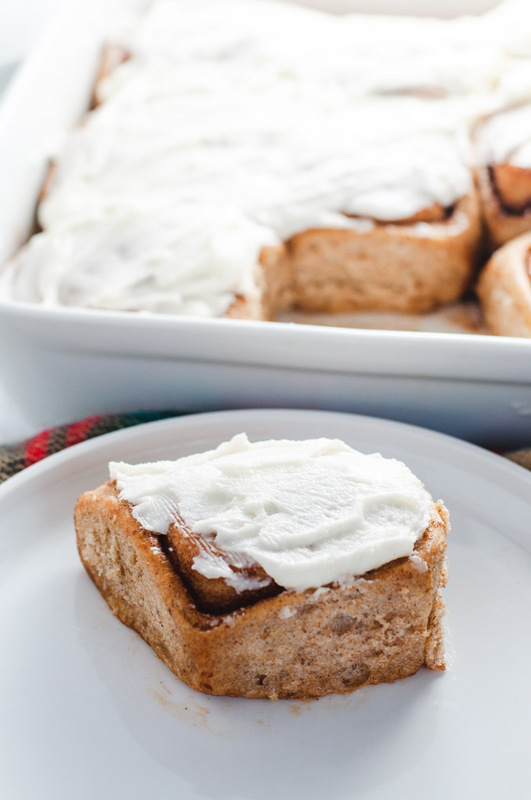 This vegan cinnamon roll recipe was first shared almost a year ago; in fact, it was one of the first recipes on the blog! Today I’m sharing it again with new photos and the same ole’ tried and true recipe. 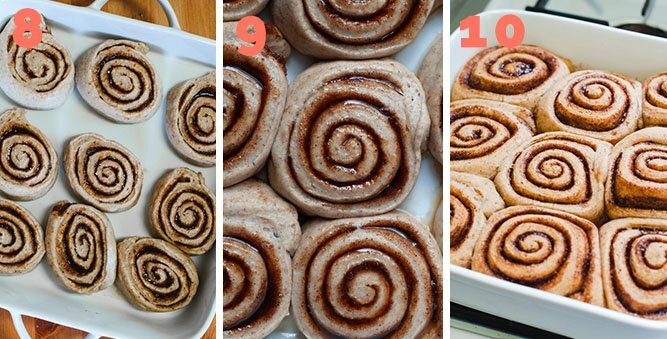 These vegan cinnamon rolls use oil instead of vegan butter. Why? 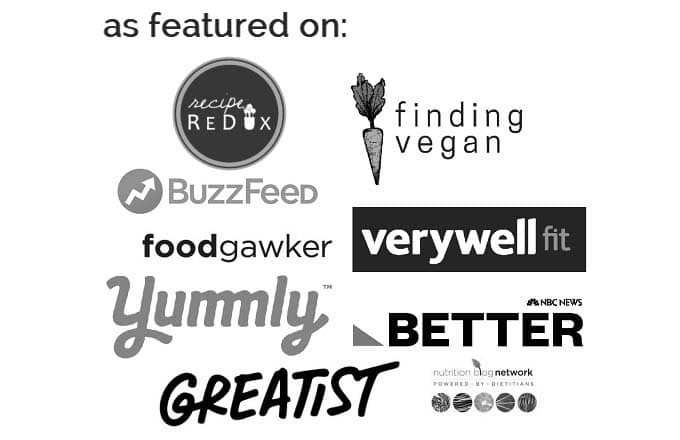 Well, I’ll be honest: I’m not a huge fan of the flavor of vegan butter. 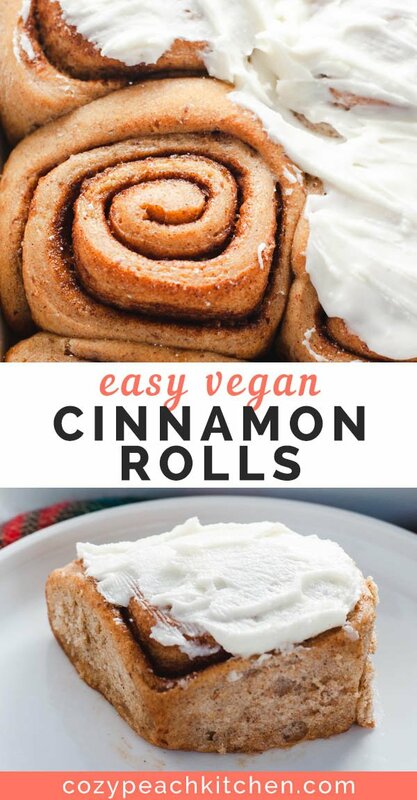 So I found a way to make my favorite cinnamon roll recipe vegan and butter free! The result? 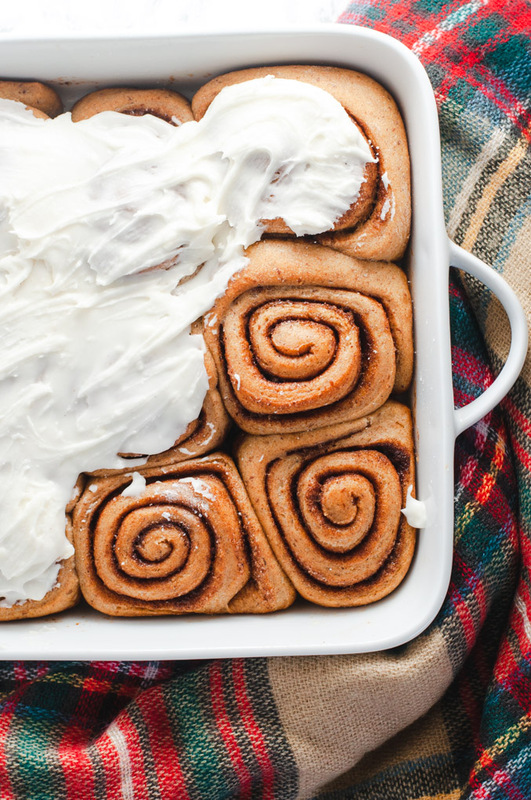 Soft, fluffy, sweet cinnamon rolls that scream winter comfort. To the new baker, yeast breads may be intimidating. Enriched dough is a good place to start because it doesn’t take nearly as much time to make as a sourdough or sandwich loaf, and it’s easier to knead due to the high fat content. The high concentration of fat and sugar in enriched dough yields a soft and tender bread. Cinnamon rolls are usually made with butter, or at least they are in my family. This recipe actually came about because I didn’t have any butter (vegan or otherwise) on hand, but I wanted to make cinnamon rolls. It was snowing and cold outside, so I did what any cinnamon roll lover would do: improvise! It turns out that canola oil is a great substitute for butter. 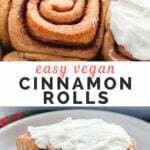 Using canola oil instead of waiting for butter to soften cuts down on prep time and makes these vegan cinnamon rolls extra fuss-free. Unlike most “classic” cinnamon rolls (like the ones I grew up on), these vegan cinnamon rolls are made with 1/3 wheat flour and 2/3 all purpose flour. The whole wheat flour gives the sweet, sweet rolls a little extra flavor without sacrificing the soft texture. There are two rises for these cinnamon rolls. The first is about 45 minutes and the second just 15 minutes, depending on the warmth of your kitchen. 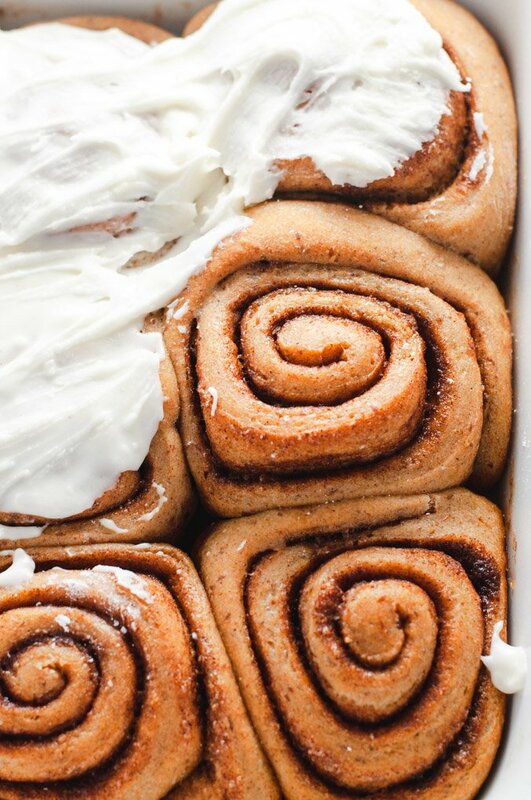 All in all, these cinnamon rolls are ready in under two hours, which is quick for a bread. Dissolve the yeast. You’ll start by dissolving active dry yeast in a mix of warm non-dairy milk and water and sugar. Cover with a damp towel and let sit for a 5-10 minutes, until bubbly and activated. Add the oil, salt, and flax eggs. Stir everything together. Stir in the flour, cinnamon and nutmeg. You can use a stand mixer, hand mixer, or a large wooden spoon for this part. Add 1 cup of flour at a time, stirring to combine. Once ~5 cups are added you should be able to start kneading it without it sticking to your hands too much. Knead the dough until smooth and elastic. Turn the dough out onto a lightly floured surface or baking mat. Knead for 7-10 minutes, until soft and elastic. Sprinkle with more flour if the dough is too sticky, but be careful not to add too much. The humidity of your room will affect how much flour is needed. Let the dough double in size. Place your dough in an oil bowl, turning to coat both sides. Cover with a damp towel and let it rise in a warm area for 45 minutes, or until double in size. Roll the dough out. Roll the dough into a long rectangle, ideally about 1 cm thick and 13×9 inches. You may need to sprinkle the dough with flour to prevent it from sticking to your rolling surface. Add the cinnamon sugar filling. Use a spatula to evenly spread the filling. Roll the dough into a tight log; it’s okay if it’s not 100% even. Use a sharp knife to cut into twelve 1″ pieces. Layer the pieces into a greased 9×13 inch or similarly sized baking dish. Let rise for 15-20 minutes. Keep covered with a damp cloth while the dough is rising. Bake for 25-30 minutes, until golden brown. Let cool completely before frosting. Vegan butter. Make sure your butter is either mostly melted or room temperature before adding it to the mix. This will make it much easier to blend your frosting together. Powdered sugar. Also known as confectioner’s sugar, this is an integral component to any frosting recipe. Non-dairy milk. I use usweetened soy milk in my baking, but almond milk, oat milk, or cashew milk will also work. Almond extract. This is where the wonderful cinnamon roll flavor kicks in. It’s seriously the best part of the entire cinnamon roll! Simply mix the frosting ingredients together with a hand mixer or spoon. Is your frosting too thin? Sprinkle in some extra powdered sugar. Too thick? Add a small amount of non-dairy milk. 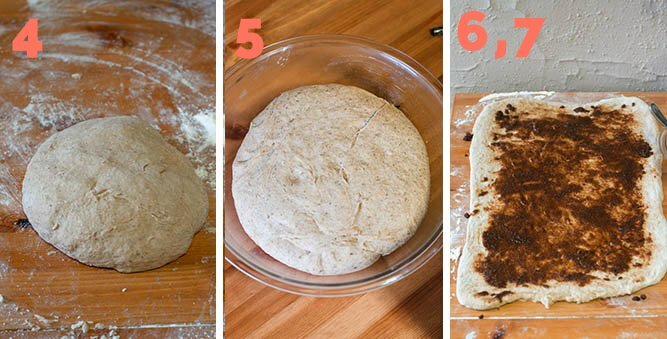 Is your house too cold for your dough to rise? Turn your oven to the lowest heat (usually 180-200F), then place the covered bowl with the dough into the oven. Shut the door and turn off the oven. This gives your dough a warm environment to rise in. 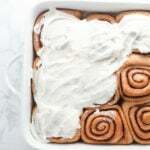 You can easily freeze cinnamon rolls to enjoy for later. Just frost your cinnamon rolls and cut into individual rolls. Freeze in layers on wax paper in a tight container. Make cinnamon roll muffins by placing the cinnamon rolls into greased muffin tins instead of a casserole dish. They require about the same amount of time to bake and become big and puffy in the oven! 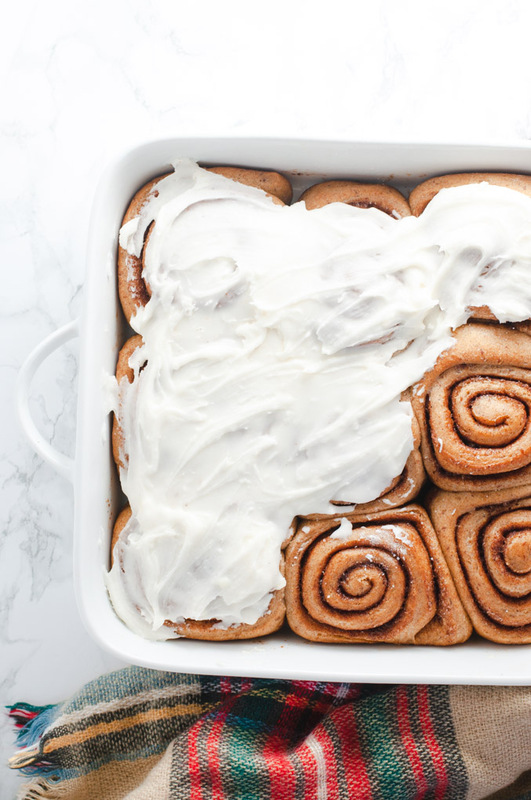 In under two hours (much of which is down time) you have ooey gooey, sweet and satisfying vegan cinnamon rolls fit for a family or a dozen friends. These white-wheat cinnamon rolls are oil-based and topped with almond flavored vegan buttercream. Make two flax eggs by combining 2 tablespoons ground flax seed and 6 tablespoons water. Let sit for at least 5 minutes before using. 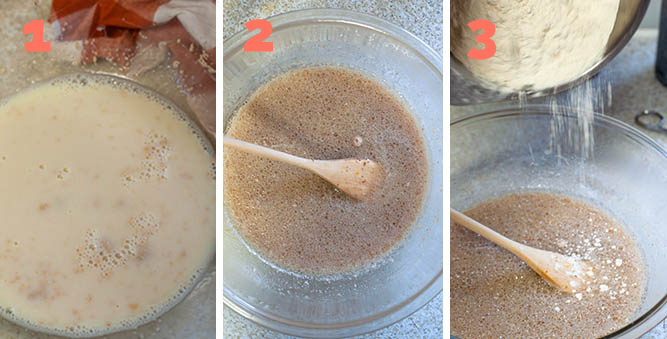 In a large mixing bowl, dissolve yeast and sugar in warm water and milk. Cover and let sit for 5-10 minutes, or until yeast is fluffy. Using a wooden spoon or stand mixer, mix in salt, oil, eggs, and cinnamon. Add 1 cup of flour at a time, stirring with a wooden spoon or stand mixer until combined. When the dough has pulled together, turn onto a lightly floured surface and knead until smooth and elastic, about 6-8 minutes. If using a stand mixer, continue mixing until the dough is smooth and elastic. Lightly oil a large bowl, place dough in the bowl and turn to coat with the oil. Cover with a damp cloth and let rise in a warm area for about 45 minutes, or until doubled in size. In a small bowl, mix together cinnamon roll filling ingredients. Set aside. Lightly grease a 9x13 baking dish. When dough is doubled in size, roll out into a large rectangle that is about 1 centimeter thick and 9x18 inches long. Pour cinnamon roll filling onto the dough, evenly distributing with a spatula. Roll dough tightly into a log. Using scissors or sharp knife, cut the dough into 12 one inch wide pieces. Evenly space the rolls in a 9x13 or similarly sized baking dish. Preheat your oven to 350F. Cover the cinnamon rolls with a damp cloth and let rise in the baking dish for another 15-20 minutes, until rolls having noticeably increased in size. Use a hand or stand mixer to combine softened butter, non-dairy milk, and powdered sugar, until a thick but spreadable glaze forms. Stir in the almond extract. 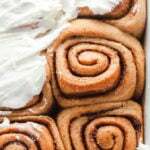 Frost cinnamon rolls once they are completely cooled. To store, refrigerate in an air-tight container and heat before serving for best taste. Freeze in air tight container for up to 3 months. "Warm" water should be ~105-108F, a little hotter than a hot bath. Too cold means the yeast won't be activated and too hot means the yeast will die. You can usually get 10-12 cinnamon rolls from this dough, depending on how thickly you cut them. The above pictures are from a 10x10 inch pan, but a 9x13 inch or similarly sized will also work.